At a New Year’s party Lizzie Barnsley fled from her violent partner to reach the deceptive safety of a towpath only to be attacked and drowned in the canal. A man was quickly arrested on overwhelming evidence; Lizzie had fought her killer, there is blood on her shoe and Peter Box had presented at a hospital with a head wound from a stiletto heel. Charged with her murder he asked for legal assistance and named Pat Molloy, a defence lawyer. Pat pleaded unfitness and handed over to his junior, Dan Grant, already hard-pressed on the eve of an ongoing murder trial. At his initial interview Peter talked but only to demand that Dan save him from conviction. In response to specific questions on the murder, on his relationship with Lizzie, even his familiarity with the relevant stretch of canal, he remained mute. Not knowing how to defend a man who refused to speak for himself, even to account for the head wound, for his DNA on Lizzie’s shoe, Dan was at a loss until, four months later, his boss, Pat Molloy, came to him with disturbing news. Pat had recently been diagnosed with terminal cancer, which was distressing enough, but his second shock was the information that twelve years ago Peter Box had come to him and confessed that he had killed Rosie Smith, a girl whose stepfather was then on trial for her murder, defended by Pat. Concluding that he was an exhibitionist, Pat dismissed Peter’s “confession”, and went on to successfully defend the stepfather, Sean Martin. Sean was acquitted on a technicality but with the strong suspicion in Pat’s mind that he had made a mistake. Now, at the end of his life, with Peter Box, the self-confessed killer of twelve years ago, accused of another murder on the same stretch of canal where Rosie Smith had died, Pat was bequeathing to Dan not only his business but a compulsion to discover the truth about two men and the nature of their involvement in two murders. Overworked, stressed by the condition of his friend and mentor, Dan summoned his dogsbody and occasional investigator, Jayne Brett, to try to make sense of the cases, and of two men whose sole connection appeared to be a false confession uttered by an unstable personality. But Jayne was a hound dog for finding and following leads and in the close-knit community of folk living along the canal she found friends and neighbours of both Sean Martin and Peter Box, but it was not until she met a man who, obsessed with the murder of his own son, had researched local deaths, that she learned Rosie and Lizzie were not alone; a number of women had disappeared in the past decade along one stretch of the canal. Are they to be considered? North Country readers will have seen the vital link and unravelled the knots long before the end. There remains the essential court scene. Neil White is a criminal lawyer and this is a legal novel depending more on technical ramifications than character. In a crime novel coincidences should be confined to the sin bin along with twins, and the climax here is triggered by a coincidence that heralds a protracted session of Grand Guignol which is excessive. But who cares about construction? 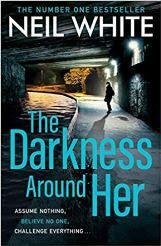 Few people will walk a towpath at night after reading The Darkness Around Her.